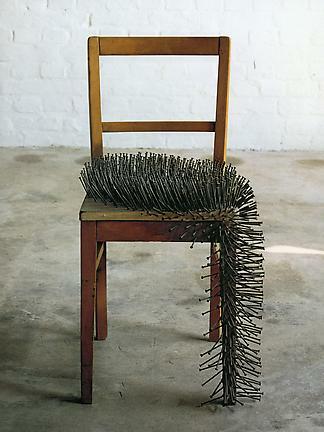 Günther Uecker was born in Wendorf, Mecklenburg, Germany in 1930, the son of a farmer on the Wustrow peninsula. He studied at Kunstakademie, Düsseldorf under Otto Pankok, where he created his first nail object (1955-1956). In 1957, Uecker met follow artists Yves Klein, Heinz Mack, and Otto Piene. In 1958 Mack and Peine organized and hosted, Das Rote Bild, in their studio at 69 Gladbacher Strasse in Düsseldorf. Uecker participated in the exhibition, which became a starting point for the formation of the ZERO group, although Uecker did not formally join until 1961. "Günther Uecker: The Early Years"